Problems of testing, measurement and verification of the wide range of product attributes in technical use has become for all serious producers an every day necessity. Especially in recent years it is possible to see rapidly increasing interest in the execution of noise tests. Generally it is possible to say that the ever-present noise has for a long time not been taken as a necessary evil ,being the negative demonstration of the activity of the technical equipment but we have to take it as a general emission-particle with what we have to reduce in the same way as with other emissions. Probably for this reason producers of cars, rail vehicles, electronics etc. must invest substantial money in the development of noise reduction every year. Accordingly to this trend the company TALPA - RPF noted the rising interest for the delivery of special sound labs where it is possible to do this kind of measurement. The realisation of these kinds of sound labs (in the highest class of accuracy) has been carried outby company TALPA-RPF for more than 20 years. The construction of the acoustic lab (the anechoic or semi-anechoic chamber) provides the acoustic modification of the suitable room with the necessary volume. The acoustic modification is realized by the assembling of the walls, floor and roof of the room with special cones from non-reflective material. 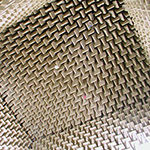 The view of the semi-anechoic chamber with the acoustic cones – see pictures. 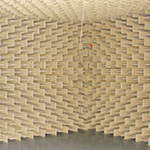 Establishment of this kind of anechoic chamber is the guarantee of the highest class of accuracy for measurement.